Welcome to our website of United Kingdom towns and villages, here you will find maps, weather, and histories of UK places. Thetford: A thriving market town which largely survived 20th century urban re-development, Thetford in Norfolk has been the home of both Boudica and James I with James I having his Royal Palace there (the King's House). Surrounded by the huge Thetford Forest, it has long been the gateway to East Anglia. Great Yarmouth - One of the UK's most popular seaside resorts, Great Yarmouth in East Norfolk has been attracting holidaymakers since the 18th century. There has been a town here since Roman times, and the fishing industry, especially herring fishing, has been the mainstay of the town's economy. Horse racing fans head for Great Yarmouth on a regular basis as the town has its own racecourse. Great Yarmouth Map. Wymondham - Well known for its double towered Abbey and 17th century timer framed Market Cross, Wymondham has a population of around 12,000 and is a popular tourist destination, with narrow winding streets and a popular Friday market which has existed since the 13th century. King's Lynn - To start with named Lynn or Lin (and later as Bishop's Lynn), the vibrant port and town of King's Lynn in Norfolk was at one time among the most significant sea ports in Britain. It at this time has a populace of about 43,000 and draws in a fairly large amount of travellers, who head there to absorb the historical past of this fascinating city and to get pleasure from its many fine attractions and live entertainment possibilities. The name "Lynn" stems from the Celtic term for "pool or lake" and refers to the truth that this place had been covered by an extensive tidal lake. Hunstanton - A town which developed as a seaside resort during Victorian times, Hunstanton is notable as the only west facing coastal resort in East Anglia. The one time popular pier has now virtually disappeared after various disasters including fires and storms. The resort is also well known for its attractive striped cliffs which back a fine sandy beach. Heacham - A large village on The Wash, located to the south of Hunstanton, Heacham has a couple of fine sandy beaches and a number of caravan parks which are popular with holidaymakers. Windermere - Situated close to the famous Lake Windermere, the town which got its name from the lake is an important tourist area in an ideal spot for touring the Lake District National Park and of course Lake Windermere itself. Windermere town does not touch the shores of the lake though Bowness-in-Windermere does. Ambleside - A charming little lakeside town at the northern end of Lake Windermere, Ambleside is a good spot for exploring the Lakes region and there is plenty of accommodation available in the town. While there you could visit Stagshaw Gardens (National Trust), Waterhead Pier and Loughrigg Fell. 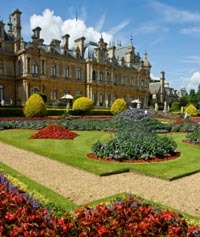 Waddesdon - Location of the famous Waddesdon Manor, this small, charming village is located to the north-west of Aylesbury in Buckinghamshire. Waddesdon. Stevenage - One of the Hertfordshire New Towns built in the 40's and 50's, Stevenage existed as a settlement and town long before this time, being inhabited back in Roman times and probably even before this. Located beside the A1 (M) it is now a busy commuter town with easy access into central London. Canterbury - A historic city which is one of England's primary tourist attractions, Canterbury has lots of historic structures to see and enjoy. Canterbury Map. Newmarket - Headquarters of English horse racing, Newmarket has been holding horse races since the 12th century. James I built the first grandstand on Newmarket Heath and also held the first cup race. Newmarket Map. Northampton: A large market town lying on the River Nene in the East Midlands, Northampton has a population of around 205,000 and a history going back to the Bronze Age, when it developed as a farming settlement. Northampton later became significant for its shoe industry. Liverpool: The 3rd largest city in England and the 4th largest in the entire UK region, Liverpool is famous for its docks and its vibrant music scene, which produced such famous names as the Beatles, Gerry and the Pacemakers and the Searchers. St Lucia - St Lucia is a popular holiday island, located in the Windward Islands, in the Caribbean Sea. St Lucia Map. Italy - Southern European country bordering France, Austria, Switzerland and Slovenia, Italy is a poplular tourist destination. Italy Map. Alicante - A compact city and port, Alicante is overlooked by the Moorish, Santa Barbara Castle. Alicante Map. Torrevieja - Surrounded by 2 huge salt lagoons, Torrevieja has been important for the production of salt since Roman times. Torrevieja Map. Benalmadena - A popular beach resort on the Costa del Sol, Benalmadena is sandwiched between Torremolinos and Fuengirola. Benalmadena Map. Florida - A state in the south-eastern region of the USA, Florida has a population of around 18 million. Florida Map. Clearwater - A city of 108,000 people, Clearwater is situated in the Tampa Bay Area, in Pinellas County, Florida fl. Clearwater Map. Cabo San Lucas - A popular holiday destination and sport fishing centre, Cabo San Lucas has plenty of high class holiday developments to choose from. Cabo San Lucas Map.